Beat butter and sugar in large bowl with electric mixer on medium speed until light and fluffy. Beat in eggs, one at a time. Mix in sour cream, milk, food color and vanilla. Gradually add the flour mixture on low speed (or by hand) just blended. Do not overbeat. Spoon batter into 30 paper-lined muffin cups, filling each cup 2/3 full or spoon batter into 24 plain flat bottom ice cream cones – fill right to the point vanilla ice cream cones becomes wider. Bake 20 to 25 minutes or until toothpick inserted into cupcake comes out clean. 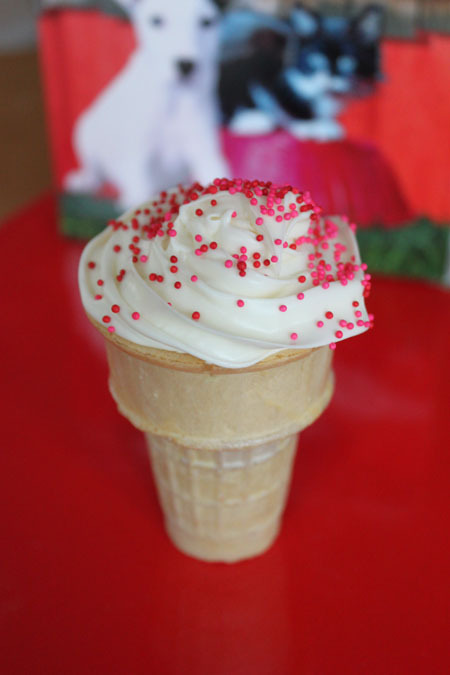 If using cones, use a skewer or knife and poke a hole in the bottom (or on the side near the bottom) of the baked cupcake cone to allow steam to escape (helps prevent a soggy cone). Cool in pans on wire rack 5 minutes. Remove from pans; cool completely. Cream Cheese Frosting: Beat cream cheese, softened butter and vanilla extract in large bowl until light and fluffy. Gradually beat in confectioners' sugar until smooth. Makes 24 to 30 cupcakes depending on method used. Note: To make ahead, bake and cool as directed, put cones in a freezer bag (remove any extra air from bag), freeze overnight, frost while frozen, serve a few hours later.